If you believe you are on the side of truth, you are most likely at ease. After all, truth remains long after attacks on it have ceased. It is usually those who feel threatened with the possibility of being wrong who make the most noise, who bare their teeth menacingly, and who feel most uncomfortable with respectful discourse and debate. This is the reason many Darwinists and atheists hesitate to debate science with proponents of intelligent design. As long as they can label opponents of Darwinian evolution as “unscientific” or “religious”, they don’t have to critically analyze or defend their beliefs to anyone. This is also the reason for the National Center for Science Education (NCSE), which exists to support and promote the teaching of evolution in public schools. Its inflated name makes it sound like an official government agency or national public institution. It is actually a small outfit in Oakland, California, headed up by activist and former professor Eugenie Scott, who for the last twenty-five years has made it her mission to quell any opposition to the teaching of evolution in American public schools. According to the organization’s website: “We and our members enthusiastically support the right of every individual to hold, practice, and advocate their beliefs, religious or non-religious.” But that support ends at the doors to scientific inquiry. In the realm of science, the NCSE will do everything in its power to keep evolutionary theory’s critics and doubters silent. And that includes students and teachers. The other half of the film is shot in New York and tells the story of director Greta Schiller and her run-in with a Darwin-doubting Biology professor in graduate school. The professor had reminded students that evolution is a theory and that attempts to compare fish, chicken, and human embryos amounted to propaganda for evolution. For a filmmaker strongly influenced by the liberation movements of the 1970s, this was too much. Schiller was only too happy to go on the offensive with Scott. Make no mistake – the main target of Scott and No Dinosaurs in Heaven is “creationism” or creation science, the belief that the universe and living organisms originate from specific acts of divine creation, as detailed in the Biblical account. However, the scientific theory of intelligent design is also under attack from Scott, who, like many other members of the scientific establishment, still cannot understand or accept that intelligent design is a purely scientific pursuit wholly separate from creation science. Indeed, Scott lumps the two together on the NCSE website as “intelligent design creationism” or “IDC”. How convenient. The state of science education and scientific literacy are very important issues. To find solutions and establish clear goals for the future, we need respectful, objective interaction that adheres to the true spirit of scientific inquiry. 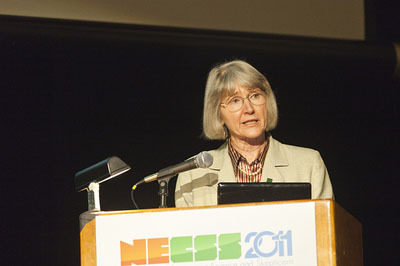 Eugenie Scott and the National Center for Science Education are bent on preserving evolutionary theory as the only explanation for life and origins taught in American classrooms. Their efforts are noisy, menacing, and disrespectful, and only serve to divert attention and delay progress. Our children deserve more than that. Editor’s Note: The original version of this article incorrectly stated that the documentary No Dinosaurs in Heaven was the NCSE’s “first foray into documentary film.” In fact, NCSE officials have participated in several other documentaries over the years. Also, the original wording may have been misinterpreted by some to mean that the NCSE produced the film in question. Although past and present NCSE officials star in this film, and NCSE officials have participated in multiple screenings designed to promote the film, the documentary itself was not produced by the NCSE. It was directed (as noted in the article) by filmmaker Greta Schiller.